Spring officially begins March 20th! Longer days and warmer weather are soon to be here with spring. The clocks have already sprung forward an hour, and sprouts are ready for spring! To prepare your landscape for the upcoming Spring season, the following helpful tips will ensure your home or business will be blooming at its best. Check for disrepair caused by freezing and thawing from the winter. Remove old, decayed, or dead plants and limbs. Maintain large trees by trimming, and refresh mulch. Prepare tools for spring planting. Sharpen and repair your tools as needed. Now is also the time to order trees, shrubs, and perennials. Remove dead, damaged, and diseased branches from woody trees and shrubs. Spring is a perfect time to trim shrubs as signs of new growth come. Spring blooming trees and shrubs should be pruned after flowering. Sitting idle for the winter months may have left your mower slow to start. Pull back winter mulch as the dangers of cold freezes are behind you. Cut back ornamental grasses. Clean bird feeders and baths. For extra embellishments, add garden decor. Early Spring is the time for lime. Take a soil test to determine your pH levels and respond appropriately to achieve proper nutrient levels. Enrich soil as necessary, adding dolomitic lime to raise the pH or elemental sulfur to lower the pH. Remove sod, weeds, and debri to prepare for planting. Check compaction and drainage as poor conditions will lead to an early demise of plants. Adding compost or organic matter is one way to ensure a proper foundation. The ideal first plants to install are trees and shrubs as they define the landscape. Trees and shrubs will provide shade to nearby areas, affecting the amount of sun reached by perennials. 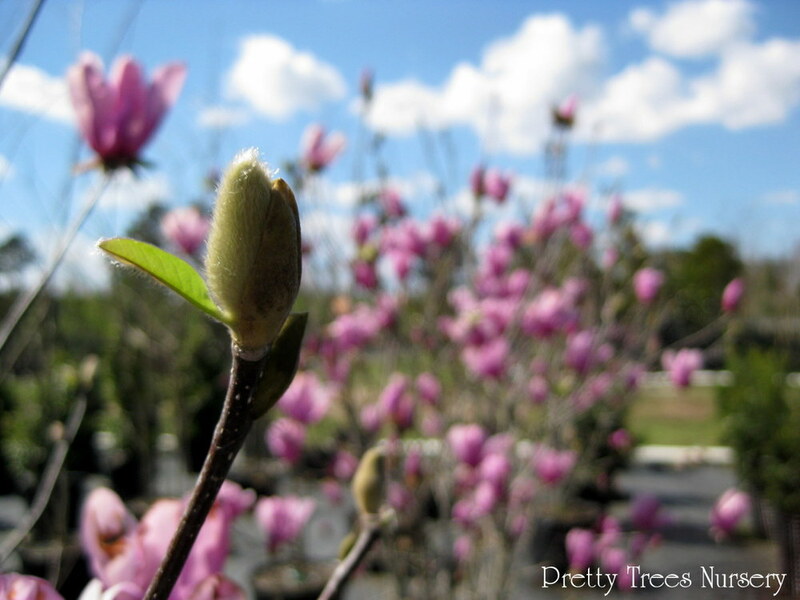 Pretty Trees Nursery offers landscaping services to help improve the style and architect of your landscape. Remember, building healthy soil is a continuous process. These tips will help prepare your landscape for the upcoming spring, but consistent maintenance will ensure a healthy home for your trees and plants throughout the changing seasons. If you are uncertain, contact local arborists and experts to aid in large tree removal and adjust pH levels. Feel free to decorate your gardens with more than just plants. Pretty Trees Nursery now offers one of a kind handmade metal art. If you have additional questions regarding trees and shrubs for your landscape, feel free to contact us.We appreciate your business and hope to continue serving your home and business's horticultural needs. Have a happy spring!